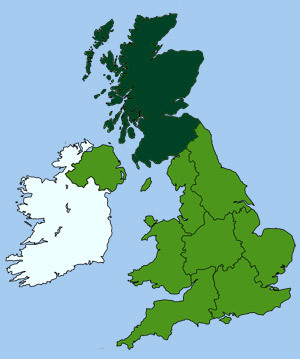 The South of Scotland contains the counties of Dumfries & Galloway and the Borders. Southern Scotland is a lush green landscape of rolling hills, that stretch between Edinburgh and the English borders. The is an area of magnificent scenery but with a turbulent history. The border region was fought over for hundreds of years during the middle ages and is littered with castles and fortified towers, which provided a constant reminder of its violent past. Its many monasteries such as Melrose, Jedburgh and Kelso, also indicate the once pious nature of its inhabitants. Covering over 1800 sq miles of unspoilt countryside this region of Scotland is an area of sweeping landscapes and dramatic beauty. With the hills and moorlands in the west to the agricultural plains in the east. The most romantic and beautiful place is how Sir Walter Scott described the area, which he made his home. Running between market towns is the mighty River Tweed, forming the historic boundary between England and Scotland. At 97 miles long the Tweed is one of the best salmon fishing rivers in the world. Historic market towns, pretty villages and hamlets have flourished along its banks, whilst its many tributaries branch out into the rich expanse of countryside. The Rivers Galloway and Esk, in this area are also popular for fly fishing.